If you’ve ever glanced up at the ceiling and taken a close look at your crown mouldings, you’ve probably seen cracks and separations that you never noticed before. If you’ve ever moved into a new home and had all the crown mouldings and door casings develop cracks and separations within the first year, or if you painted the crown mouldings and cracks developed within a year, there is an explanation for all of this! It’s pretty simple, wood is hygroscopic and every piece of sawn or milled moulding has a unique and specific direction or orientation of wood grain. The physical characteristic “hydroscopic” means that wood will always try to reach moisture equilibrium with the surrounding atmosphere. It will either absorb moisture (from the air) during periods of high humidity or off-gas moisture into the air during periods of low humidity. The wood moisture content is constantly changing throughout the year due to the changing seasonal weather conditions. And depending on where the moulding was cut out of the tree or limbs, the moulding has a specific wood grain pattern (the pattern of the tree’s annual growth rings). The two most common grain patterns that arise from the production of sawn lumber and milled mouldings are flat-sawn and cross-grain. Wood expands and contracts with changes in wood moisture content, swelling when wetted and shrinking when dried. These movements in wood take place tangentially and radially to the wood grain. This results in the distorted shapes shown in the attached figure. Flat grain lumber tends to warp and twist, while cross-grain lumber tends to maintain a stable profile. 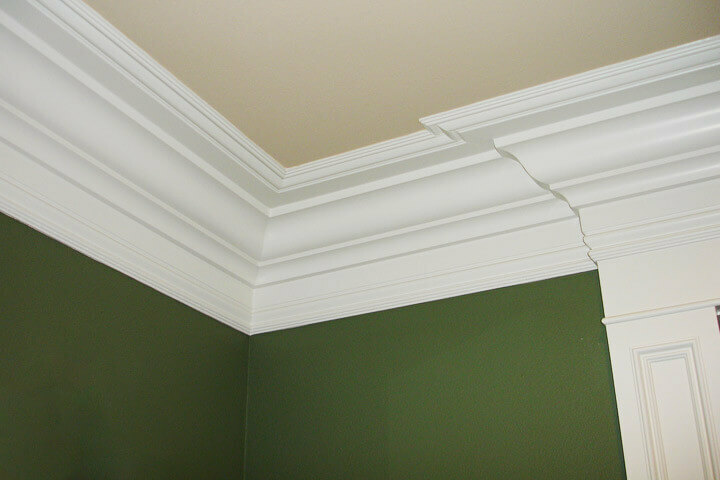 Hence, long, relatively thin pieces of crown moulding with flat sawn grain are always wanting to distort according to their grain patterns as the moulding dry during the winter time (heating season) and take on moisture during the spring through fall (cooling season) and when windows and doors are often left open causing the interior humidity levels to rise along with the outdoor conditions. After multiple attempts or years of caulking and painting wood mouldings, the paint/caulk usually form a flexible covering which is strong enough to withstand the movements in the crown mouldings due to humidity changes inside the home. This is because the crown mouldings will eventually reach a stable or “mean” (average) moisture content throughout the year, based on each homeowner’s unique living style, such that the ensuing wood movements that do occur, due to humidity changes, results in such little movement, that the caulked joints to not tear open or crack. Many foundation repair contractor salesman will point to crown mouldings and wood casing cracks and separations and exclaim that they indicate foundation movement or floor sag, so therefore structural repairs are needed. There is nothing farther from the truth as this. Remember to contact us if you need further information on any of our inspection services or if you need to schedule an appointment.